The Berliner by MaBiDaTi LegoWelt makes great use of the new(ish) Dark Red brick profile brick, contrasting them with the Tan window trims. Similarly, the green (brick built!) door and windows on the ground floor provide their own contrast to the Tan facade. Also, at four stories high, I imagine the Berliner probably stands quite tall! The rear of the Berliner has some great details too, including another brick built door, a trellis with flowering vine and in-built air conditioner unit. There also seems to be a mix of old and new greys, given extra texture to the walls. There does not appear to be an interior for this building, but you can find more images of the exterior of the Berliner on MaBiDaTi LegoWelt’s Facebook page. 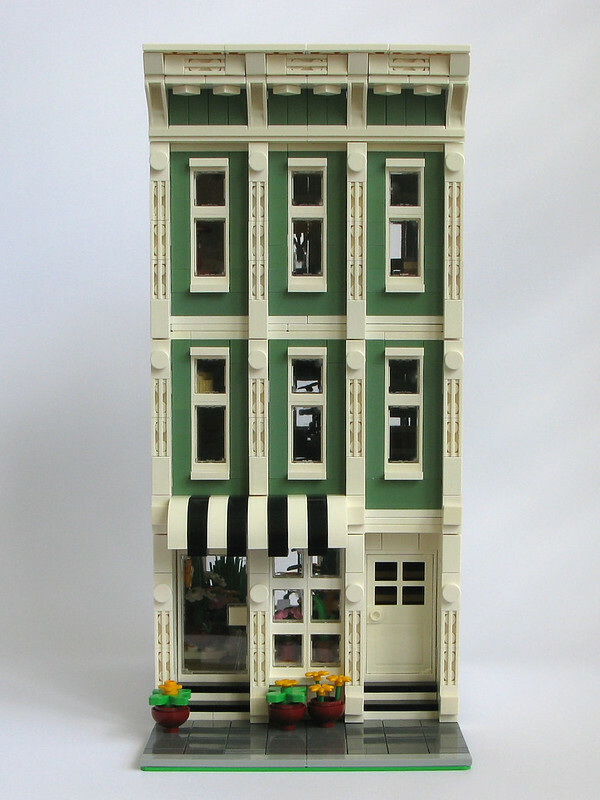 I’d like to present to you my latest MOC modular building, Blooming Blossoms. This one combines a few favourites for me – Sand Green, 16-stud wide, and lots and lots of flowers!